A week ago, Dan and I, along with Matt, were in Baltimore for the Baltimore Comic-Con. It’s been ten years since we tabled at our first convention in Chicago, and in that time we have learned a lot and grown as writers. That doesn’t always translate to sales, which were less than “soft.” But we did have a lot of great interactions with fans, and creators, so I can’t complain. Despite always entering these conventions with high hopes, I don’t believe Dan and I have ever deluded ourselves. We are certainly working against the tide—offering anthologies that include prose stories as well as comics, most often in black and white, lacking superheroes or Dr. Who or zombies (for the most part) or manga-influenced art, all of which are big draws at these cons. And we aren’t into the hard sell. Add to that the fact we are only able to attend a single convention a year, and the chips are stacked against us really gaining any type of foothold. But that’s okay. Because getting a table affords us opportunities we might not have going to these as “just fans.” We get early entry, don’t have to wait in line, have a place to sit and store our stuff, and, even if sales are not what we hope for, we are proving to those professionals and publishers we do see regularly that we are persistent and committed to our writing. That said, despite soft sales, we did have some great interactions with fans attending the show. One of the items we had available, for free, was a distinct nametag with your sci-fi name on it. 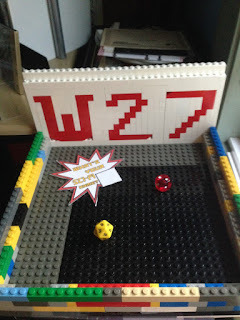 I crafted a Lego coliseum within which anyone could roll two dice—a 6-die and a 20-die—to find out their character type (alien, smuggler, bounty hunter, star pilot, explorer, or universal despot) and their specific name (from a list of 20 each for male, female, or neutral). Kids and parents alike loved these. They were rolling dice all weekend. And it was great. 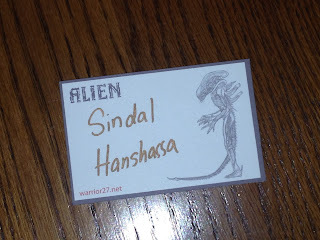 The kids, regardless of age, were all excited to find out their strange, otherworldly names such as Tiik’Al or Quellon or Axlotl (keen-eyed science fiction buffs will recognize that last one), and the parents were equally intrigued and enthused by the prospect of finding out their sci-fi names. That was a surefire hit and we got to have some nice conversations with people about the show, when they rolled for their nametags (including meeting someone originally from Lebanon, Maine). So, did we sell a lot of books? No. But did we get to interact with fans and have a good time behind the table? Oh, yeah. But what about walking the floor and meeting artist and writers and other professionals? Find out about that, tomorrow, in the second half of my Baltimore wrap-up.